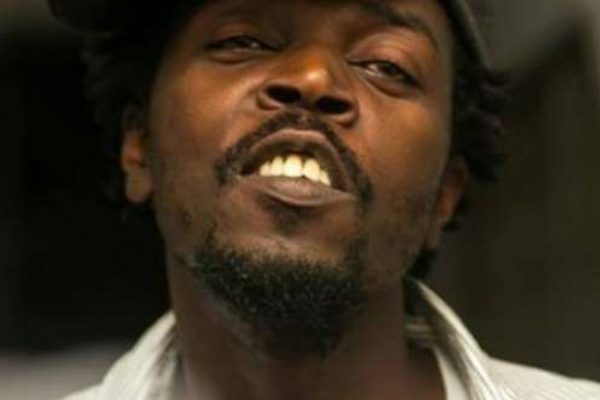 Rapper Kwaw Kese said he would see nothing wrong, if his child decides to smoke marijuana. 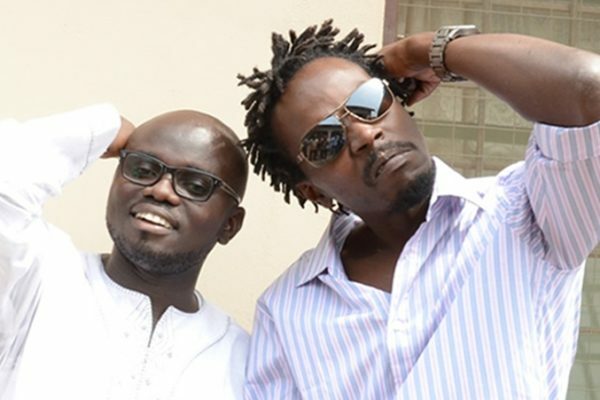 The Abodam crooner is known for speaking his mind always and has made no apologies for his use of marijuana. It should therefore not be surprising when he says he would not mind in the least if his kids use it as well. His comments may not endear him to many people and he will certainly not be winning any parent of the year honours but Kwaw Kesse does not really care. “I will not force my children to stop using marijuana if they think it is good for them. It is like food. If my child walks up to me and says daddy, I think weed is good for me and I want to use it, I can’t do anything about it as long as they do not abuse it or use it for the wrong reasons,” he said in a chat with Graphic Showbiz. 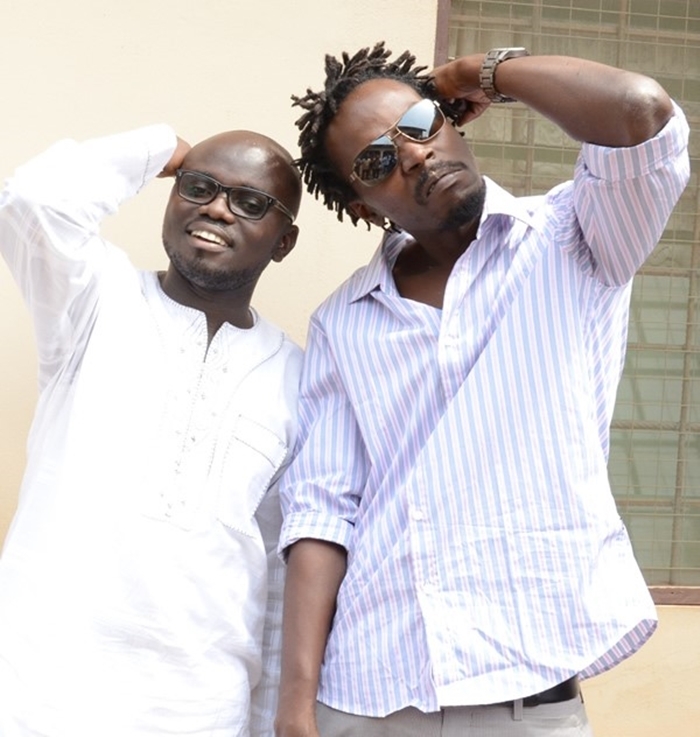 Kwaw Kese has had problems with the law over his use of marijuana. In 2014, he was arrested for smoking the herb in public in Kumasi and put before court. 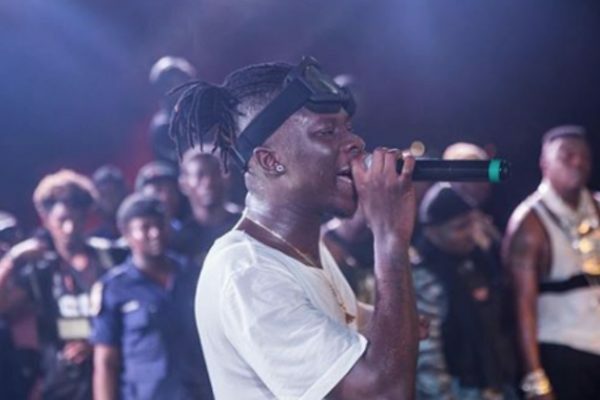 He endured some tough times at the Kumasi prisons and the drama surrounding his application for bail played out in the public eye. After his release and subsequent fine, he said he was embarking on a campaign against drug abuse in the country. One thing he is disappointed at and wishes he could change is the negative perception about people who use weed. For him, there are several benefits Ghana will derive fromlegalising weed. 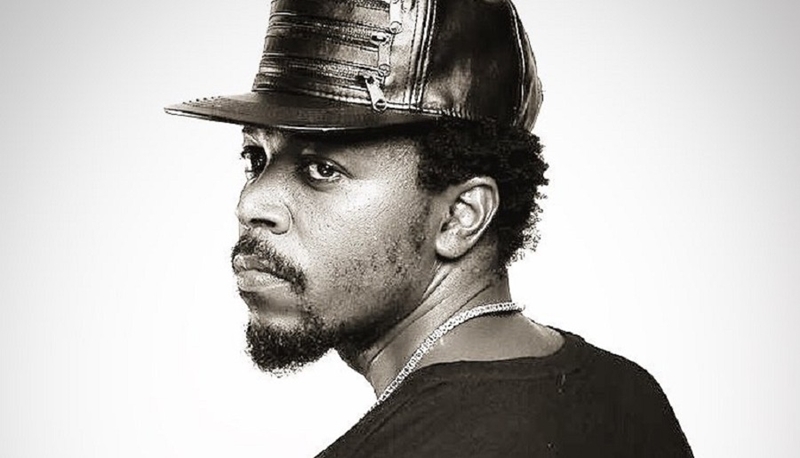 Away from his kids and weed, Kwaw Kese revealed that his Mad Time Entertainment label will have another addition next month. “We will be officially signing Skonti next month and at the same time, we will release his new single. Skonti is an artiste and a producer as well. We have worked on a number of songs including “Yakubu,” he said. The controversial rapper, Kwaw Kese has revealed that he still actively smokes cannabis and even the police are fully aware of it. According to him, not even his imprisonment in 2015 for smoking weed in public, deterred him from engaging in the act. Kwaw Kese, born Emmanuel Botchwey, was arrested by the police in Kumasi on Saturday, November 22, 2014, for allegedly smoking cannabis in public. On Thursday, April 23, 2015, Judge William Boampong sentenced him to a day’s imprisonment and a fine of GHc1,200. 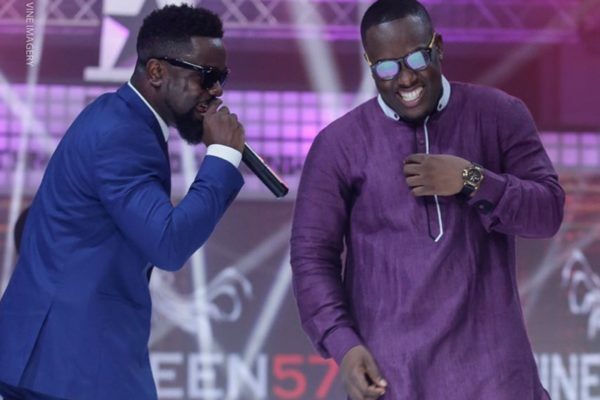 Speaking in an interview on Cosmopolitan Mix on Joy FM with Doreen Andoh, the rapper revealed that he is done pretending that he does not smoke the banned herb. 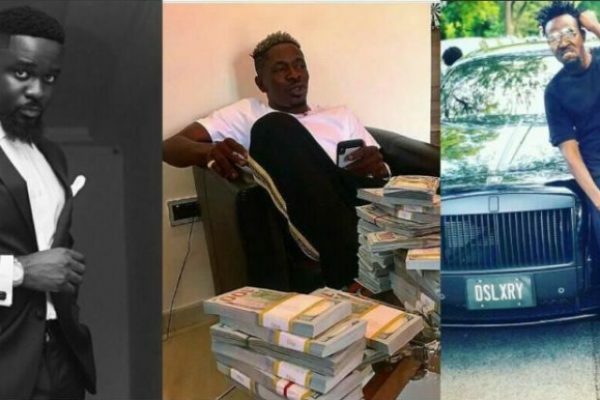 “As we age, you can’t hide the truth forever…I smoke and it’s good for me…I’ve been smoking for almost 20 years or more; there’s never been any implication,” the controversial Rapper, popularly called ‘Abodam’, declared. “I still smoke…before I got arrested, I was doing music to please people, I was ‘spoiling’ every stage which I still do and I was smoking weed doing that so I don’t want people to be like ‘because he got arrested, he’s stopped what he is doing’ Then I have to stop music; I still smoke weed…I used to be hiding it [but] now I want the world to know…” he said and cited that Nigerian musician Wizkid also smokes weed on stage. He strongly believes that the law that makes it a crime to smoke weed is outmoded and must be amended. “I know some people in Parliament who smoke weed…I know a doctor who smokes weed and he still performs alright,” he further alleged. According to him, students smoke in tertiary institutions and the same students turn out to become bank managers, medical doctors and lawyers later. 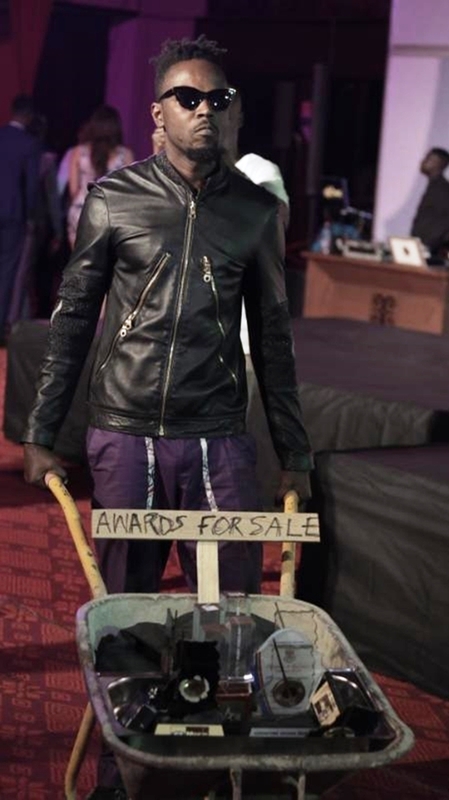 Rapper Kwaw Kese caused a stir on the red carpet Ghana Music Awards 2017, when appeared with a wheelbarrow containing several award plagues including his VGMA plaques. 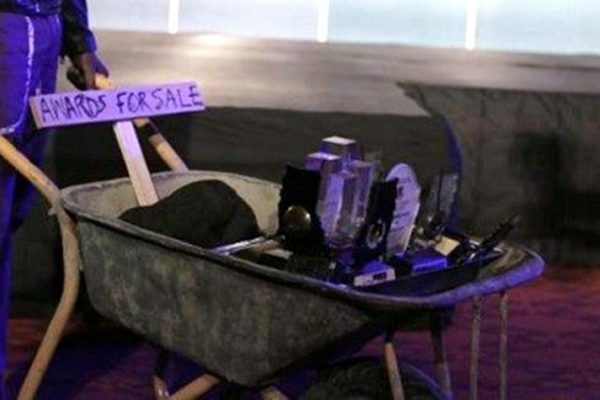 Kwaw Kese’s wheelbarrow which was labelled ‘AWARDS FOR SALE,’ caught the attention of people at the foyer of the Accra International Conference Centre. Kwaw Kese has in the past won awards like Artiste of the Year, Hiplife Album of the Year, Hip life Artiste of the Year and Hiplife Song of the Year in 2008; Hip hop Song of the Year in 2012 and other nominations in the Vodafone Ghana Music Awards. 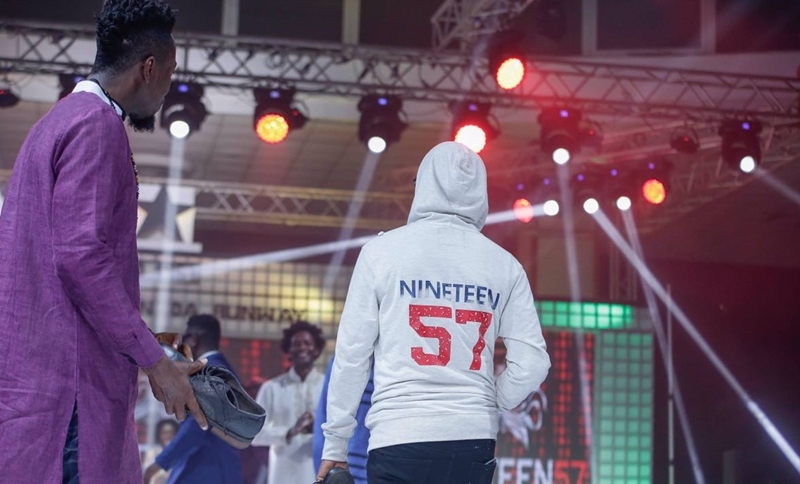 Broadcaster/Fashion Designer Kofi Okyere Darko popularly known as KOD had some male celebrities model in his fashion brand NINETEEN57 BY KOD at the just ended ‘Rhythms On The Runway’ 2017 fashion show. The event which took place at the Banquet Hall, State House on Saturday April 1, 2017, saw male celebrities including Rapper Kwaw Kese, Actor Harold Amenyah, Benny Blanco, P.Y. Addo Boateng, Musician Coded, among others hitting the runway to climax the fashion show. 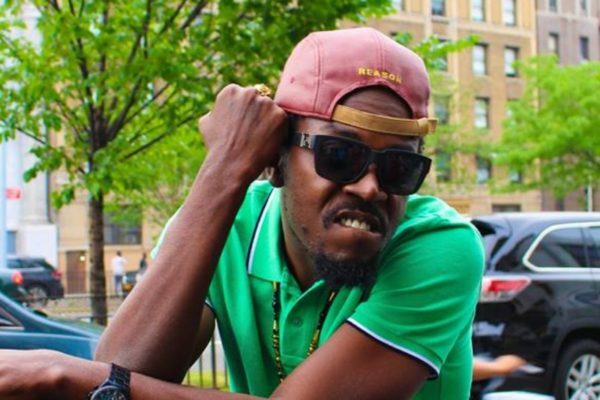 Controversial Rapper, Kwaw Kese has expressed disappointment in the inability of the Police to find the killers of his manager who was murdered at his Manet Gardens residence on the Spintex Road three years ago. 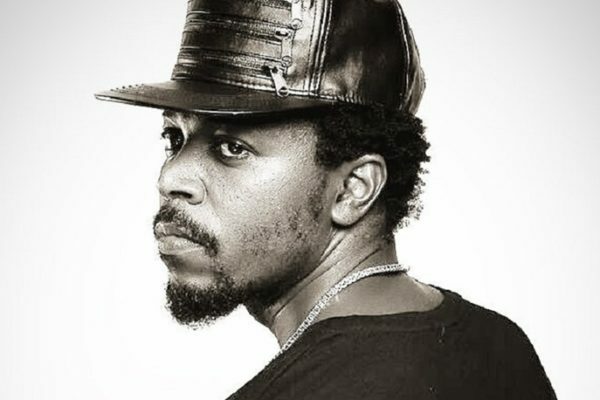 In fact, today, Monday, March 13, marks exactly three years when the entertainment enthusiast’s life was taken and Kwaw Kese believes the police should have answers by now. “The Police need to give us answers on who the killers are. For Christ’s sake, it’s been three years and yet there seem to be no head way. This isn’t a practice that should be encouraged because no one would feel safe in his/her home. “A hardworking young man with so much potential is taken away from his young family because someone or some people think he doesn’t deserve to live. “And after three years, the police is yet to find who the perpetrators are? The police can’t provide answers? Who killed Fennec? We need to ask the police,” he said to Showbiz in an interview on Tuesday. The Yakubu artiste said the image of the lifeless body of his manager who he described as a friend and a brother lying in a pool of blood breaks his heart anytime he thinks about it and it beats his imagination that the country has been silent on it. “Today, it is Fennec, tomorrow, it could be any of us. This isn’t an issue that should be brushed aside. The Police must be compelled to quicken investigations which have obviously been stalled,” he stated. The Police is not the only outfit that seems to have awaken the wrath of Kwaw Kese. He also took a strong exception to the lackadaisical attitude of Zoomlion, the employers of Fennec. For him, the company hasn’t shown much interest in the death of one of its hardworking staff and that is quite worrying. Although Kwaw Kese appointed a new manager to handle his music career six months after the death of Fennec, the Mr Lover Lover rapper says his murdered manager is irreplaceable and he is still grappling with his loss. “The journey hasn’t been easy without Fennec. He was my backbone and the initiator of most of my projects. We were two paddies who managed the Mad Time Entertainment outfit. His absence has affected my career and slowed me down,” he stated. Known for hit songs such as Oye Nonsense, Ma Tewo Kwakwa, Swedru Agona, Ruff and My Thing, Kwaw Kese said the one thing he would always remember his late manager for was his creativity. “Fennec will forever remain in my memory for his creativity and artistic knowledge. I say this because it was out of his creativity that a star was born in me”. When Showbiz contacted Zoomlion on its commitment to find the assailants of its former staff, Fennec, Mr Robert Coleman, Public Relations Officer of Zoomlion, said he needed to consult management before making any official statements on their contributions three years of Fennec’s death. The PR Unit of the Criminal Investigations Department of the Police was unable to comment since it was not able to immediately track document on the case due to an on-going reshuffle of personnel within the Service. Rapper Emmanuel Botwey, better known as Kwaw Kese looks to make February 14 for patients of the Pantang Psychiatric Hospital in Adenta, in the spirit of the season: love. 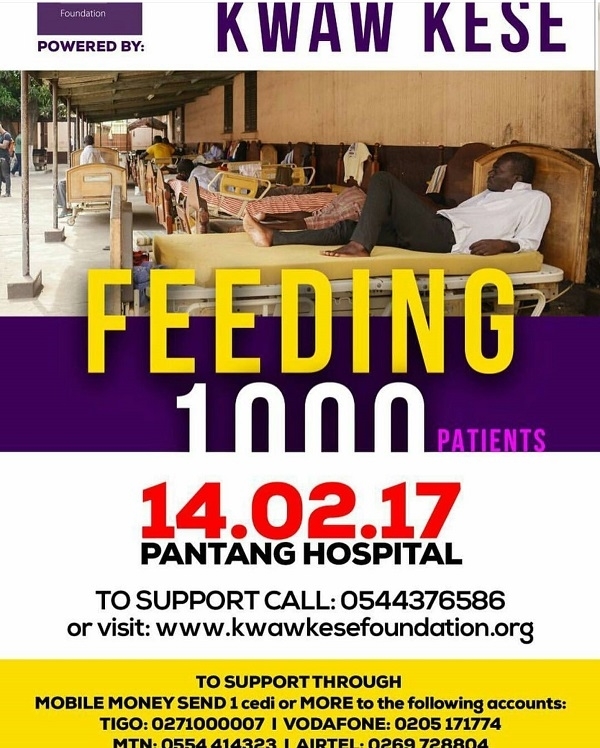 His Kwaw Kese Foundation hopes to feed some 1000 patients in the institution, in the latest of his charity activities, which has become regular since his stint in the Kumasi Central Prison in 2015, mainly focusing on donating to inmates to somewhat ease the harsh conditions they face behind bars. Popularly called “Abodam”, Kwaw Kesse was born Emmanuel Botwey and rose to fame with his 2007 Abodamalbum. He’s also known for such singles as Nonsense, Poppin, Monkey Dey Work, and Who be You. He’s also prepping for his upcoming talent show “Streetism”.